We can’t all take off to the islands, but that shouldn’t keep us from enjoying the tropics with one of the season’s hottest trends. Exotic florals, vivid island colors, and palm prints are all the rage for Spring 2012. One of my favorite ways to incorporate the tropical trend is in maxi dresses - like this ELLE one I got at Kohl’s! I mean really, what says island living more than a flowy floral dress? For a little extra coverage, I also added a SONOMA life + style crochet cardigan and finished off the look with a beaded fringe Y necklace also from SONOMA. I love this look, not only can it be worn for the everyday grind, but I can also see myself packing this for our annual trip to Puerto Rico! Comfy and stylish – just what I like to wear on vacation. How do you plan on incorporating the tropical trend into your wardrobe? Remember to visit the Kohl’s Style File to learn more about the hottest trends for Summer. Super cute! Love that dress! Love how you styled it! 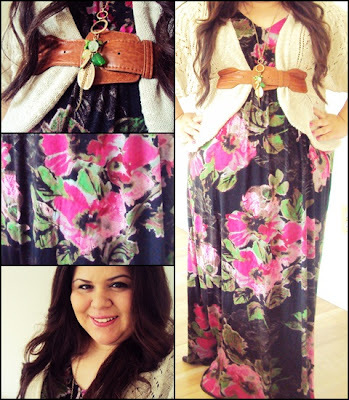 Fabulous dress, and I love the belted sweater with it! I love your dress! Looks really pretty on you. I'm hosting a giveaway. You might want to check it out - super-fun kid's stuff. What a fantastic dress/print! Kohls has been really fashionable this spring/summer!!! Kohl's has really stepped up their game recently. I love shopping there! So cute! That dress is a gorgeous print. J'adore maxis AND that fabulous print!